In today’s applications data is produced at unprecedented rates. While the capacity to collect and store new data rapidly grows, the ability to analyze these data volumes increases at much lower rates. This gap leads to new challenges in the analysis process, since analysts, decision makers, engineers, or emergency response teams depend on information hidden in the data. 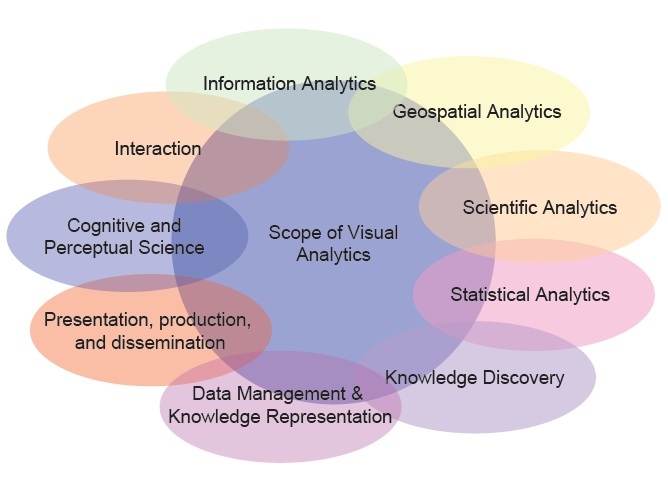 The emerging field of visual analytics focuses on handling these massive, heterogenous, and dynamic volumes of information by integrating human judgment by means of visual representations and interaction techniques in the analysis process. Furthermore, it is the combination of related research areas including visualization, data mining, and statistics that turns visual analytics into a promising field of research. This paper aims at providing an overview of visual analytics, its scope and concepts, addresses the most important research challenges and presents use cases from a wide variety of application scenarios.